You don't have to leave your heritage flowers behind when you move. This month I spent a lot of time in East Van and I added another website to the Your Key Series on the Captain Vancouver Real Estate Network for East Van called Vancouverites luv east van (YourKeyToEastVan.com). How does this bring me to my next posting on Flowers in the family? Well East Van is right near Burnaby which makes me think about my wife's grandmother because she has lived there for over 50 years. I visit her frequently and in the spring her Hydrangeas start to bud. Then again pretty much all of the other cities in the lower mainland neighbour Burnaby so maybe I'm making a leap here. Either way when I think spring in Vancouver I think hydrangea-grandma-Burnaby and the closer I am to seeing Burnaby combined with spring..I think Grandma Marion! It doesn't matter in what order or if it make sense to you..just go with it. It's one of those memory association things we all get. Balkan Street Home where the original hydrangea was located. So the story of the family hydrangea goes like this. My father-in-law bought this for his grandmother Jesse (Grandma Marion's Mother) when he was 10 years old. They lived on Balkan Street in Vancouver. In 1969 my father-in-law's mother moved to a new house in Burnaby where she remains today. 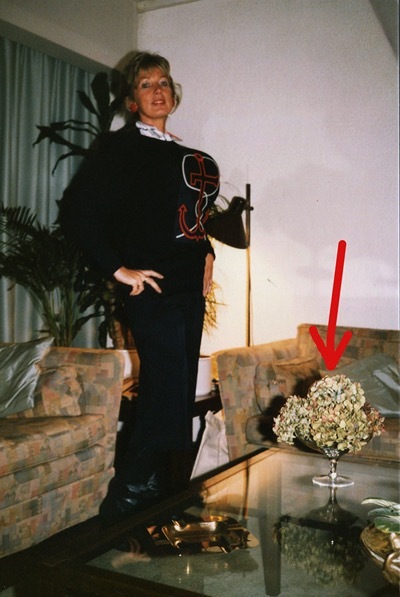 According to my wife this hydrangea has been the backdrop, centerpiece and side piece of every family photo possible, for example, here is my wife's aunt from Holland posing beside the table with the same 'dried' hydrangea. Now I know what you are looking at and thinking! Not one to deflate your day, those aren't fake flowers-- I assure you! 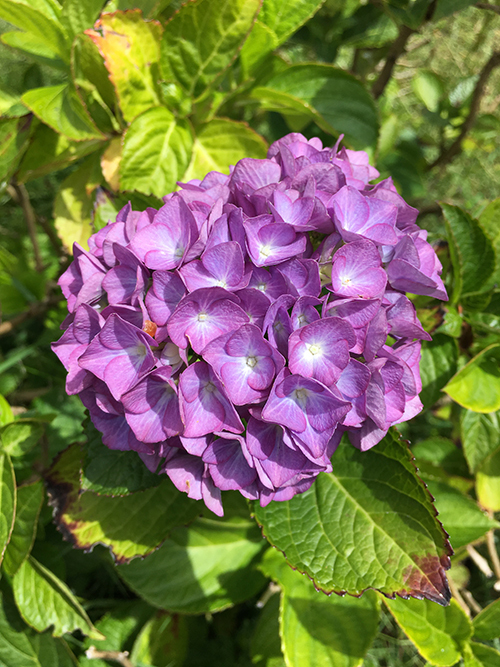 They are real, genuine, and the same flowers from the family Hydrangea. Although they may not look real-they are! I have to say one thing being Captain Vancouver and all..I sure like the nautical theme on Auntie Mini's shirt and at this moment I'm glad Auntie Mini lives an entire ocean away. Anyway the plant lived in the same spot for 25 years facing west and then was uprooted and moved on the same property to its current spot facing south. I'm assuming that the move is due to Hydrangeas being more of a shade plant-who knows, but the family photos have moved right along with the plant. Back to the Hydrangea.this posting is about heirloom flowers (ok your still looking at that photo aren't' you..come on stick with me here). Great-grandma Jessie has long since passed (as a side note she lived in Burnaby until 108 years of age) and her grandson who gave it to her has passed on as well, but the Hydrangea that was given as a gift from a 10 year old boy to his grandmother is still with us. 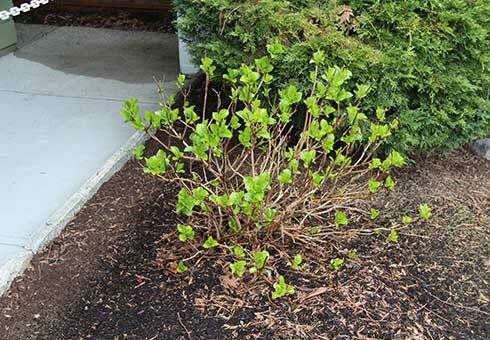 So my wife is going to attempt to take a cutting of the Hydrangea that grew in Burnaby that was a cutting from the first plant on Balkan street and replant it in Langley at my parents' house where we know it will live for at least another 20 years under the care of my parents who have the green thumbs in our family. My wife is documenting the clipping here and next year we will transfer it from the container to the ground. In truth the family Hydrangea looks like it has seen it's last years, it used to be much fuller when we look at the old photos and compare it to how it currently looks so we hope this will work. Our intention is to save it before it just stops blooming. The longer term goal is to eventually take some clippings from the Langley plant and give to the great-great- grandchildren who we know in time will move about the Lower Mainland and maybe even out of the province-- as a way to always stay connected in some way. In case you are even more amateur at gardening than us, "heirloom" is defined by age in this case that might be any plant that originated before 1951 before Hybridization became popular or for some the definition is met if the plant is open-pollinated and was grown in an earlier era. Our family Hydrangea was given around 1950 which puts our plant at 65 years. We asked around.checked out the UBC botanical garden forum, hopefully bought the right stuff and have the right info. and now we are ready to go! Check back in to this blog for updates! 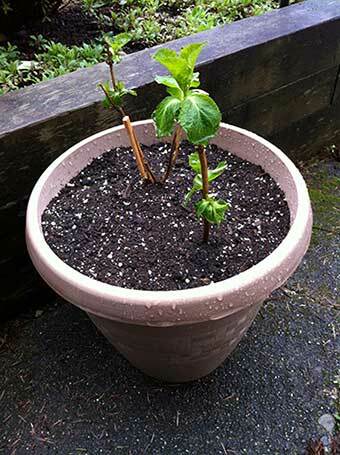 Well Grandmas Hydrangea was transplanted from the pot to its new plot at my Mom's house in Langley where it is being loving cared for. We weren't sure it would bloom so fast but it did! Here's hoping it will bloom for many more years!